Start out 2012 with a fabulous new web presence. From Midnight on Sunday January 1st, through the end of Monday January 2nd, we will be running a half price sale to celebrate the New Year! That’s 50% off the regular subscription price your first year – that’s your first year for $199.50. Happy Holidays to all our amazing clients! Our office will be “officially” closed from December 24th – January 3rd. We will still be answering all support questions, and keeping a watchful eye on everything, but the response time might be a little more delayed than usual. We look forward to introducing a ton of new products early in 2012 and seeing you at Imaging and WPPI. Hope you all enjoy some downtime with your loved ones! 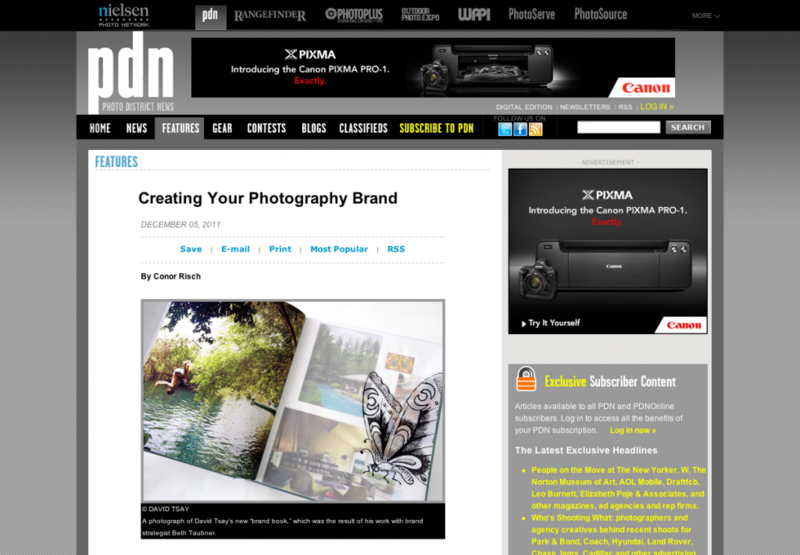 We are honored to be a part of a new Photo District News article called “Creating Your Photography Brand”, alongside the amazing design firm of Liska + Associates and brand consultant Beth Taubner. Creating and maintaining a web presence is a crucial part of your brand but there is a lot that goes into that. One of the biggest goals with our creation of Photography BlogSites was to make it as easy as possible to bring your photography brand online. We are so happy to be included in this article! The print version is expected to be available in January, which will be an exciting way to start the new year!